So quick background, I'm familiar with and love building kits (tekno associated)and prototyping and building things. (3d printer and cnc machine). I know that might sound weird, but would love to build something over the top to mess around in my backyard and parks and beaches. I know about the trx-4 and sport kit, but was wondering if there is anything else or if I could just build from parts with some good instructions.. Build a toyzuki V3 with trx4 axles, forward mount motor with a toyzuki 2.5 t case running a VP dig unit on the back. That'd be baller. Do a thread if you're doing this! If your good with a CNC machine and protyping you should buy a rectangle sheet of g10 and see what happens. Design it yourself. As stated the Toyzuki V3 is a good option, don't get the v1 or 2 if you want portal axles though. Maybe do some 24k gold axle weights and diamond headlight lenses too if you have all that extra pesky money laying around. So I orders the diamond and gold in bulk for the build but having a hard time finding the V3 Toyzuki chassis...... Just kidding,I actually dont mind spending some money every once in a while on the things i enjoy, and figured a rock crawler wont get as beat up as my Monster Truck so ill build once. build right. Plus i always get the upgrade itch after a kit build. However i really am having an issue finding the V3 Chassis, I found the V2 chassis a few places online. Any links or advice where to check? Last edited by ferp420; 04-14-2019 at 07:47 AM. Looking to build a scaler, I already have a Tekno MT410 thats my fast go crazy monster truck. Looking for something more subdued and realistic. I have a 4 channel receiver, and figured i could do, 2 speed transmission and locking diffs. I know that its probably unnecessary, but like the idea of it and love the build process and research. As for building my own frame as an option, for anyone whos done it, is it really worth the hassle? Im not sure im ready for that much for my first crawler since I have alot to learn about the setup also. If designing your own chassis isn’t appealing to you, then skip that part. It could get a little frustrating and kill your motivation about the build. Contact Ben directly at his bookface page. Toyzuki fabrication There are a couple vendors that sell the V3 but they never update their inventory. It's rather weird but I just bought another V3 a few weeks ago. Thanks white-trash. I figured and sent him a message before, just wasnt sure if there was something else. Sorry for all the questions, but one more I'm not sure of. With the toyzuki, is it better to also buy a kit for the other parts? I'm guessing just get everything seperate since I'm thinking of going with the portal axles and the VP dig looks great. But what about the shocks and rest of the drivetrain? Last edited by louielc; 04-14-2019 at 09:13 AM. The servo and panhard mount come as a kit and they work very well on the chassis. I've tried other mounts and they don't work as well without a whole bunch of tinkering. The motor mount is solid on the V3 too and pretty much required unless you are doing something basic like a center mounted scx trans. The 2.5 t case is a very nice piece in it's own right but a dig unit would make it better. The rear axle output comes off of a standard scx bottom gear so a VP dig would be simple once the mounting is ironed out. Shocks are simple, scx10, trx4, dravtech, 2660/2661 traxxas big bores etc all work well. If you haven't figured it out I have a V3 on trx4 axles with everything but a dig unit. Is there a reason that a V2 won't work with portals? Just wondering. That would be cool! Dew it! A V1 or V2 will work but you're going to have a monster truck. The V3 has a lot more rise above the axles to keep the chassis low. This is my V3, nice & low over the axles. Last edited by WHITE-TRASH; 04-14-2019 at 09:34 AM. Nice, I figured you had one that's why I wrote your name in the message. Are you doing brushless or brushed on the build. And just to make sure, the Panhard and other kits are from toyzuki also or just straight axial? That's where it gets complicated. To run trx4 axles under a V3 most everything in the link department needs to be 1 off or fiddled with to work. 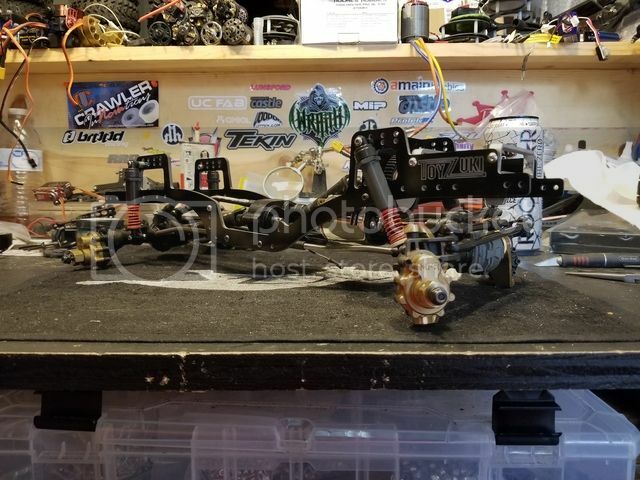 The front links are all VP wraith lowers, the dog leg shape makes things clear, especially the upper as it snakes around the motor to the axle. There is a 6mm spacer outside of the normal mount moving the upper link to the driver side too. The panhard and drag link are custom bits too, I have a collection of random Ti and stainless links so I rummaged around and found some that work. They could have been off the shelf but I honestly don't know from what. Last edited by WHITE-TRASH; 04-14-2019 at 10:12 AM. Nerds are extreme snobs and dicks online! If you came onto this forum and asked "Wut tires are the best?" or "Where can I find the manual to an Axial SCX10?" you may have been ignored or ridiculed because those have been answered to death or can be found with a simple Google search. That doesn't happen nearly as much on this site as it used to. People are friendlier and more easy going than in the past. You had a good question though. Whatever you decide to build, please post the build thread on this site! This is the noob section and it was a well thought out post. Come to general and post something stupid and you'll have a different response.